Will the plots with the collection be taken or not? Status as of September 2010. Pavlovsk Experiment Station of VIR was founded in 1926 by N.I. Vavilov 45 km from Leningrad (now St. Petersburg) to study perennial grasses, cruciferous root and fruit crops cultivated in the North-Western region. Today at Pavlovsk Experiment Station of VIR collections of fruit and berry crops as well as perennial grasses (in total 5610 accessions) are regenerated, studied and stored in field condition. NOTE: The collection of fruit and berry crops of VIR encompasses around 6000 accessions, among them: apple - 649, pear - 124, service tree - 19, sour cherry - 138, sweat cherry - 34, plum - 326, black currant - 943, gooseberry - 238, raspberry - 193, strawberry - 975, blue honeysuckle - 244, and 1587 accessions of ornamental plants and others. The collection of fodder crops of VIR harbors 5610 specimens, 4704 of which are included in the constant catalogue and 906 - in the temporary one. In order to restore germination and to preserve the fodder crop collection in viable condition 4198 accessions (53 species) were grown and 1808 were reproduced. At present 4-year cycle of reproduction of 575 forage crop accessions at isolated plots has been completed. The fruit collection of VIR at Pavlovsk Experiment Station is considered to be not only the most complete in the world, but also the most stress-resistant. It endured severe winters of 1939-1942 (-40-45 C), 1974-1975 (-38-43 C), drought of 1972, abnormal winter (-35-40 C) and not less abnormal summer of 2010 (+30-35 C). As of September 2010 Pavlovsk Experiment Station of VIR has at its disposal 23 plots with the total area of 495 hectares. 19 of these plots with the total area 397 hectares are the property of St. Petersburg and the remaining 4 plots (combined in two plots with total area 19,5 ha and 71,4 ha) with the total area of 90,9 hectares are the property of the Russian Federation. The plot No.18 (19,5 ha) is occupied by the fodder crop collection and was appointed by the RZhS (see the map) for the auction scheduled on 23rd of September 2010. На участке №2 (71,4 га) 35 га заняты коллекцией плодово-ягодных культур и декоративных растений Всероссийского Института Растениеводства им. Н.И. Вавилова. Thus, the N.I. Vavilov collection at Pavlovsk Experiment Station appeared to be on the territory owned by the Federal Government what entitles the Federal Property Management Agency under the Ministry of Economic Development of Russia to dispose of the land at its discretion. The Federal Agency transferred the plots No.2 and No.18 to the RZhD as a contribution of the Russian Federation. On December 25, 2009 the Federal Property Management Agency issued two resolutions (Orders No. 2058-R and No. 2061-R). They sanctioned termination of perpetual (irrevocable) tenure over lots No.2 and No.18 granted to VIR's Pavlovsk Experiment Station and conveyance of this land within three months to the Russian Housing Development Foundation. This was astonishing for the VIR scientists, since within 2009 Pavlovsk Experiment Station of VIR was visited by several inspections to audit efficiency and targeted usage of land. Earlier this year representatives of the Russian Housing Development Foundation (RZhS) as well as the Government of Russia represented by the Federal Property Management Agency have paid several visits to the Pavlovsk Experiment Station, then another four inspections followed. Their releases have proved efficiency and targeted usage of disputed plots. Activities of the Russian Housing Development Foundation are regulated by the Federal Law dated as of 24.07.2008, № 161-FZ "On the promotion of housing construction". The article 15 of the law stipulates that the right of perpetual (irrevocable) tenure, operational management or economical management on the land or real estate property located on it terminates on the decision of the inter-collegiate body - the Government Commission on the housing development and the Public Authority exercising powers of the Russian Federation on management and disposal of the Federal property - Federal Property Management Agency, without approval of organizations, institutions, enterprises and regardless of grounds provided by both the Civil Code of the Russian Federation and the Land Code of the Russian Federation. At the suggestion of Vice-Governor of Saint Petersburg the Government Commission on housing development has decided to transfer the land of Pavlovsk Experiment Station to the ownership of the Russian Housing Development Foundation (RZhS) as a property contribution of the Russian Federation. The article 15 of the law stipulates that the Federal Agency must take a decision within thirty days from the date of submission of the relevant documents in regard of the land. On 16.02.2010 the Federal Agency and the RZhS have signed transfer-acceptance acts on the mentioned real estate property. On the 1st of April 2010 there has been registered a termination of the perpetual tenure right for the Pavlovsk Experiment Station and registered the ownership right for the Russian Housing Development Foundation. On 18th of February 2010 administration of the Pavlovsk Experiment Station appealed to the Arbitration Court of Moscow with a claim. On 30th of March 2010 administration of the Pavlovsk Experiment Station and N.I. Vavilov Institute of Plant Industry dispatched letters to: The Russian President Medvedev D.A., Russian Prime Minister Putin V.V., First Deputy Prime Minister of Russia V. Zubkov, First Deputy Prime Minister of Russia, Shuvalov I.I., Minister of Agriculture of the Russian Federation Skrynnik E.B., Chairman of the Accounts Chamber of the Russian Federation Stepashin S.V., Prosecutor General of the Russian Federation Chaika U.Y., Chairman of the Central Committee of the Communist Party of the Russian Federation Zyuganov G.A., President of the Russian Academy of Sciences Osipov Yu.S., Head of the President administration Naryshkin S.E., Director General of the Russian Housing Development Foundation Braverman A.A.
On the 31st of March 2010 the Registration Chamber of St. Petersburg deprived Pavlovsk Experiment Station rights for both plots and granted them to the Russian Housing Development Foundation on April 1. Administration of Pavlovsk Experiment Station of VIR sued to the Arbitration Court of St. Petersburg against the Registration Chamber decision and appealed to the Moscow Arbitration Court against the orders issued by the Federal Property Management Agency. On the 2nd of June 2010 Executive Director of the Global Crop Diversity Trust Fund Professor Cary Fowler visited Pavlovsk Experiment Station with the purpose to get acquainted with the situation at the Station and to observe the field collection. After his visit N.I. Vavilov Institute and Pavlovsk Experiment Station obtained powerful support from foreign mass media and world scientific community. Both Russian mass media and representatives of scientific circles didn`t stay indifferent. On 15th of July 2010 the Moscow Arbitration Court approved the decision to convey the plot No.18 (19,4 ha) to the Russian Housing Development Foundation for the auction. On 5th of August 2010 representative of the Public Chamber Nadezhda Shkolkina (the Chairman of the Public Council under the Ministry of Agriculture of the Russian Federation) visited Pavlovsk Experimental Station of VIR. The ground for a visit was an address of Vice-president of the Russian Academy of Agricultural Science I. Savchenko to the Public Chamber with a request to protect the world heritage (genebank) preserved at Pavlovsk Experiment Station. On 9th of August 2010 the Public Chamber officially addressed the Russian President Dmitry Medvedev with a request to rescue an invaluable VIR collection of fruit and berry crops at Pavlovsk Experiment Station. On the 11th August 2010 the Court took a postponed decision on the plot No.2 in favor of the Russian housing development foundation. Administration of the N.I. Vavilov Institute and Pavlovsk Experiment station intend to appeal to the Supreme Arbitration Court of Russia. 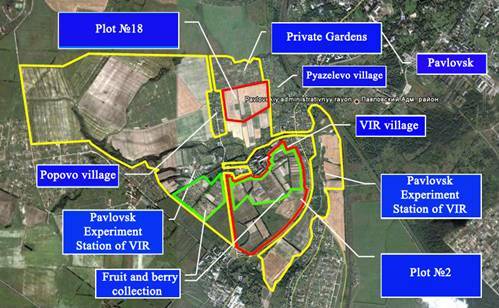 Initial cost of the plot №18 with the total area 19,4 ha made 98,6 mln RUR. According to the prescribed procedure this plot is given for a rent for 5-8 years. During this period the winning company has to work out a plan of land development and prepare a necessary housing and communal service infrastructure. Only after that the company will have a right to buy a territory as its property. On the 12th of August 2010 the Administration of the Pavlovsk Experiment Station addressed the Public Chamber of the Russian Federation. The same day members of the Chamber sent a telegram to the Russian President Dmitry Medvedev with a request to protect Vavilov`s collection. On the 13th of August 2010 President Dmitry Medvedev as an answer to the multiple requests of the representatives of both Russian and foreign scientists as well as non-govermental organization and private persons and the Public Chamber wrote in his Twitter account: “Gave instruction for this issue to be scrutinised”. On the 20th of August 2010 Pavlovsk Experiment Station of VIR was visited by a representative of the Public Chamber at the request of N.V. Shkolkina. The purpose of his visit was a personal acquaintance with a part of the Vavilov`s collection located at the station as well as creation of a video documenting the fact that the collection of plant genetic resources is really maintained in vitro in the patches No.2 and No.18. On the 31st of August 2010 Pavlovsk Experiment Station of VIR had an unscheduled inspection. The station was visited by representatives of the Public Chamber, the Accounts Chamber as well as representatives of the Russian Housing Development Foundation. After visiting two plots the commission was convinced that, indeed, the disputed plots harbor plants that make a part of the Vavilov collection of plant genetic resources. As a result of field inspection, - Nadezhda Shkolkina reports,- representatives of the RZhS Fund stated they will postpone an auction for an uncertain period. The delay will allow the government to further study the value of the crops at the plot. On the 7th of September 2010 the press-center of the Accounts Chamber stated the results of an unscheduled inspection of the plot show the ambiguity of the situation and require additional analysis. In this connection the board meeting of the Chamber held on the 3rd of September 2010 approved the program on verification of both the legitimacy and efficiency of plot usage by the Pavlovsk Experiment Station. According to the plan inspection will be held from September through October 2010, its results will be discussed at the next board meeting in early November 2010. On the 8th of September 2010 RZhS Foundation intends to conduct an independent audit of the targeted usage of disputed plots occupied by Pavlovsk Experiment Station of VIR. At the same time the Director General of the RZhD A. Braverman reported that they will be initiators of the expert commission which will include both Russian and foreign specialists in plant genetic resources not affiliated with the Russian Academy of Agriculture Science. The main task facing the experts is to assess the uniqueness of plants growing at two plots as well as to determine the amount of area occupied by them. As RZhS Foundation`s Director Alexander Braverman reports all efforts of the involved parties are aimed to find a compromise; rare plants can be relocated and auctions will be postponed for the time needed to conduct these works – approximately 5-7 years. At present administration of VIR and Pavlovsk Experiment Station are in the proсess of preparing the necessary documentation to prove presence of the unique collection at the plots and its value for the Russian and world community and efficiency, lawfulness, and targeted usage of the disputed plots.